Profile:Chantal was born in The Netherlands. Only just having finished a Bachelor’s degree in Arts and Social Sciences, she has already had the chance to get some experience in journalism, among other temporary jobs. In the future she would like to continue in this direction. Antoine was born in Colorado but has been raised both in France and in the United States. He has been educated in software development. His ambition however, is to work in his own wood shop. Together Chantal and Antoine have lived mostly in The Netherlands, in and near the city of Maastricht. For now they are living in a tent. 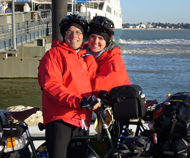 On October 8, 2007 they took off for a bicycle trip from Madrid to Cape Town. They expect to be in South Africa by December 2008. However, Antoine and Chantal are biking for fun. When a broken rib among other reasons caused them to break off an earlier attempt, they temporarily continued a regular life. This time Chantal and Antoine picked up the route from Madrid. Besides experiencing life and meeting different cultures, the bikers want to get attention for the inequality of children’s lives around the earth. They focus on a school project in Nepal to improve the educational situation of a couple hundred children. With help from the Dutch foundation which is called ‘Stichting Klein Verzet’ and Belgian-Nepalese NGO ‘Quality of Life Nepal’ Antoine and Chantal would like to support the addition of two classrooms at an elementary school in Sarangkot. For more information on this project click on the project tab in the menu of this website. Please send us a message. We will answer you as soon as we can.